Losing a loved one can be a trying time for any of us. It can be emotionally and financially challenging. 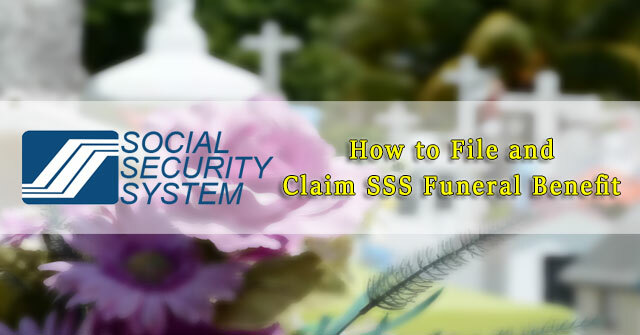 Fortunately, members of the Social Security System (SSS) can file for an sss funeral grant. These benefits can be a big help for a family during those difficult days. To begin with, the SSS Funeral Grant is granted to those who shouldered the burial expenses of the deceased member or pensioner. Since last August 2015, the amount of the funeral grant has been increased from a minimum of P20,000 to a maximum of P40,000, depending on the member’s paid contributions and CYS. 2. SSS Card or two valid ID cards/documents of claimant, both with signature and at least one photo. 3. Certified true copy of the Death Certificate of the deceased member or in case the member died overseas, a certificate issued by the Vital Statistics Office/County of the host country or its equivalent. 4. Original copy of the official receipt/contract from the funeral parlor for the funeral expenses. 5. New residence certificate of the filer. Once you have the documents ready, visit your local SSS branch and present the requirements. After checking all your documents, they will give you a claim stub which you will need to use later on as you pick the checkup. In most cases, they will contact you via SMS once your check is available. To make things easier, it is a better idea to let the person whose name appears on the funeral expenses receipt be the claimant so that some documents will no longer be required. Also, you may be interested to know that some funeral parlors actually offer to file the Funeral Claim for their clients as part of their services. That can be a good option to consider if that is possible.